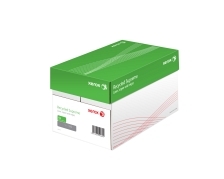 Premium quality Xerox recycled paper designed to deliver outstanding performance in laser and inkjet printers. Produced from 100% selected post consumer waste, and chlorine free. Bleached to create an excellent whiteness. Any internal Office communication, Invoices, External letters and communication. Manufactured using processes equivalent to ISO 9001, OHSAS 18001, and ISO 14001 or EMAS.